The Acer AL2016WCbd is a 20 inch widescreen monitor from Acer that doesn't have breath-taking picture quality but at its price, this will do okay for a PC monitor. The Acer AL2016WCbd comes cheap, it has a maximum resolution of a1680 x 1050 and has a 20 inch widescreen size so it's perfect for watching DVDs on your PC. The Acer AL2016WCbd delivers good picture quality, no color bleeding, blacks are blacks, no whitish color. 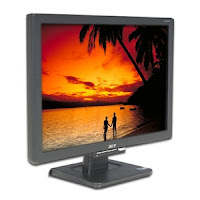 It has a DVI input which is great compared to older LCD monitors. The Acer AL2016Wcbd has no HDMI. I saw a not so popular brand on the net which has about the same specs but with HDMI connection, however, I could not see the picture quality to recommend it over this one. I hated the controls specially the power button on the Acer AL2016Wcbd, couldn't really tell if I turned it on, Acer should have gone with more subtle buttons like AOC. At under $200, the Acer AL2016WCbd is an affordable LCD monitor that would meet any average consumer's needs. Not recommended for gamers though. I saw a not so popular brand on the net which has about the same specs but with HDMI connection, however, I could not see the picture quality to recommend it over this one.